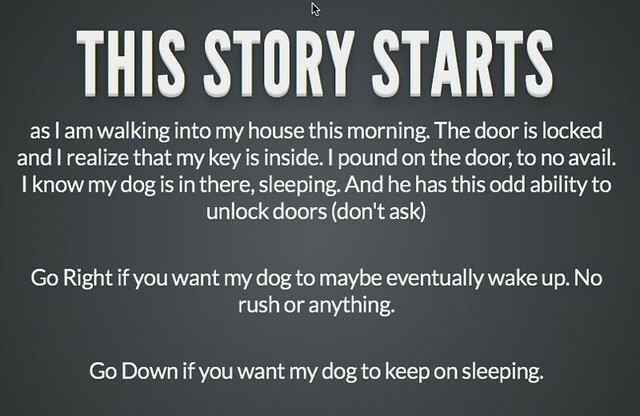 This entry was posted in Interactive Fiction, Technology Resources. Bookmark the permalink. Absolutely fun! But I couldn’t stop going back to see another path. It’s also addictive! Would you have some students write the entire thing? Would they work together. Do they need a kind of ‘mapping’ large piece of paper to visualize the parts (some could go on & on). Great stuff! (I am not a heartless reader, BTW). I loved reading choose your own adventure books in 5th and 6th grade! You and technology-always cutting edge!